The Clinton Foundation and the terror group Hamas share a key donor: The government of Qatar, a leading backer of terror groups that has emerged in recent years as Hamas’ chief financial lifeline. Qatar, which has been designated by the State Department as a "significant terrorist financing risk," has pledged more than $400 million to Hamas since 2012 and has long harbored one of the terror group’s senior leaders, Khaled Mashaal. At the same time, Qatar has sought to curry favor with elite Westerners, donating between $1 million and $5 million through 2013 to the Bill, Hillary, and Chelsea Clinton Foundation. The foundation has been dogged by ethical questions over its willingness to accept money from questionable sources, including authoritarian regimes such as Kuwait and Oman. A Clinton Foundation spokesperson did not respond to a Washington Free Beacon request seeking comment and greater details about Qatar’s donations to the charity. The Qatari government’s support for Hamas has greatly buoyed the financially troubled group, enabling it to build its terror infrastructure in the Gaza Strip and wage war against Israel, which has been struck by more than 400 Hamas rockets in the past week. In the midst of Hamas' latest rocket attacks on Israel, questions are being raised again about the political and ethical implications of the Clinton Foundation’s willingness—and by dint that of likely presidential hopeful Hillary Clinton—to partner with a government that directly funds Hamas. "The Clinton Foundation should donate the money it has received from Qatar to an Israeli charity that helps victims of terrorism—many of whom wouldn't be victims in the first place if Qatar wasn't funding Hamas," said Noah Pollak, executive director of the Emergency Committee for Israel, a pro-Israel group. The Clinton Foundation thanked its donors in a statement on its website, writing: "Their generosity makes our work possible and we thank them." 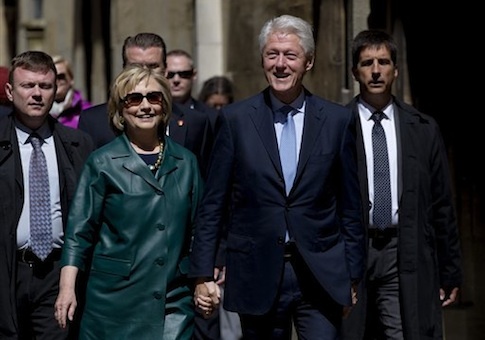 In addition to Qatar, the Clinton Foundation has accepted money from the Kingdom of Saudi Arabia and Brunei, which in May adopted Sharia Law, an extremist Islamic legal system that condones flogging and stoning by death. "The Clinton Foundation was, from the start, a trap door for ethics. Now it seems it is also a mirror into Clinton ethics, judgment, and hypocrisy," said former Pentagon official Michael Rubin, who studies global terrorism networks. "A basic rule of thumb if you’re talking about philanthropy you want to have at least four or five degrees of separation from a country that finances terror, not just one," Rubin said. Qatar’s emir has publicly courted Hamas for years, and was the first head of state to visit the Gaza Strip after Hamas assumed control. Mashaal, the head of Hamas’ politburo, was pictured Wednesday evening in Doha at a state dinner with leading Qatari officials, who pledged an additional $5 million to the terror group in May. David Cohen, the U.S. Treasury Department’s undersecretary for terrorism and financial intelligence, has referred to Qatar as "a permissive terrorist financing environment." U.S. lawmakers have routinely expressed concern for Qatar’s financing of terror groups, calling specifically on the country’s ambassador to cut ties with Hamas. "We believe that Qatar’s relationship with Hamas empowers, legitimizes, and bolsters an organization committed to violence and hatred," a bipartisan group of 24 House members wrote in a letter last year to Qatar’s U.S. representative. "In the interest of maintaining strong U.S.-Qatari relations, we urge you to promptly address these serious allegations regarding your relationship with Hamas." The Clinton Foundation has also come under scrutiny for its ties to a senior Muslim Brotherhood official who formerly worked for the charity and was arrested by Egyptian authorities last year on charges of inciting violence. Rubin said that the foundation’s funding hypocrisies deserve greater attention. "The Clinton Foundation talks climate change but funds itself from one of the top three natural gas producers. It talks women, but it accepts money from a country which supports those groups who seek to suppress rather than empower them. It talks about reducing childhood obesity yet Qatar is the poster child for gluttony," he said. "Perhaps it’s now time to see whether there is anyone from whom the Clinton’s won’t take money," Rubin said. "Maybe just the National Association of Serial Killers or the North Korea Charitable Foundation but, then again, for those, we’ll have to wait for any future candidate Clinton financial disclosure." This entry was posted in Politics and tagged Bill Clinton, Hamas, Hillary Clinton. Bookmark the permalink.